Why Are My iPhone Apps Waiting Or Stuck? Here’s The Real Fix! 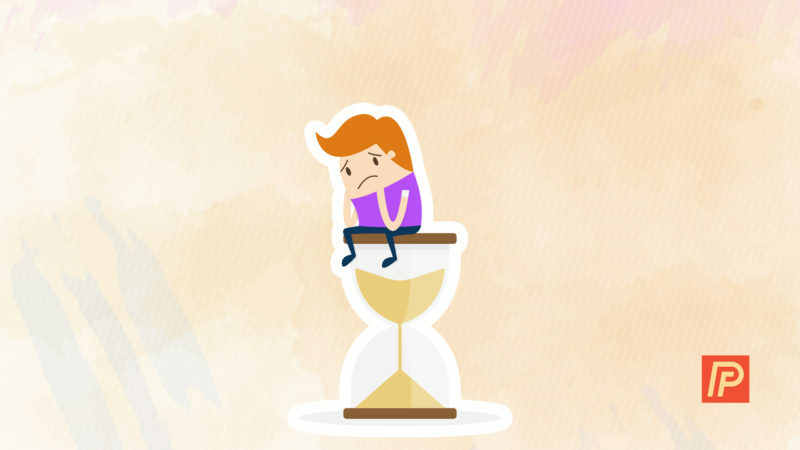 You are at:Home»iPhone»Apps»Why Are My iPhone Apps Waiting or Stuck? Here’s the Fix. You’re trying to update your iPhone apps, but they’re stuck on waiting. Thankfully, the fix for this problem is usually very simple. In this article, I’ll show you the real fixes for iPhone apps that are stuck waiting to update, both using your iPhone and using iTunes, so you can update your apps and get back to using your iPhone. You’ve gone to the App Store, visited the Updates tab, and chosen Update or Update All. It’s normal for apps to take a few moments to start the download process and do the update. But if it’s been more than 15 minutes or so and your app icon is still grayed out with the word “waiting” underneath, it’s time to do some investigating. Your internet connection could be to blame. Your iPhone needs to be connected to the internet to download app updates, so you either need to be on a Wi-Fi network or your iPhone carrier’s cellular network. The connection also has to be stable. 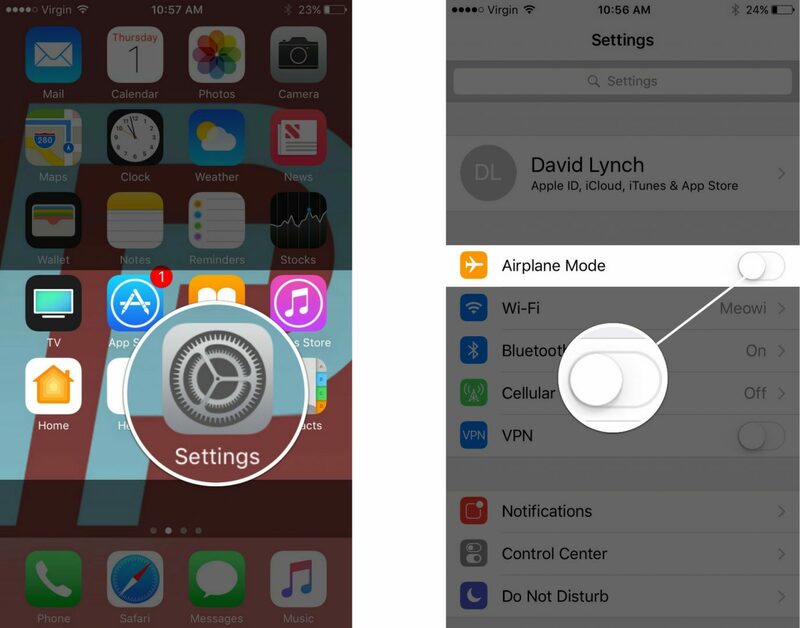 First, check your iPhone to make sure it isn’t in Airplane Mode. To do that, go to Settings -> Airplane Mode. The box next to Airplane Mode should be white. If it’s green, tap the toggle to turn it white. If your iPhone was in Airplane Mode, turning it off will automatically trigger it to reconnect to your default cellular and Wi-Fi connections. Reconnect, give it a minute, then check on your iPhone apps. The updates should start to download, giving you a progress indicator on the app icon and in the App Store under Updates. If you don’t see that and your iPhone apps are still stuck waiting, try some of our other fixes. A lot of the time when apps are stuck waiting or not downloading on your iPhone, there’s an issue with your Apple ID. Every app on your iPhone is linked to a specific Apple ID. If there’s an issue with that Apple ID, apps may get stuck. Usually, signing out and back into the App Store will fix the problem. Open Settings and scroll down to iTunes & App Store. Then, tap on your Apple ID at the top of the screen and tap Sign Out. Finally, enter your Apple ID and password to log back in. If you continue to have issues with that Apple ID, visit Apple’s website and try logging in there. If an issue exists, something will pop-up on this webpage. It’s possible that the app had an issue trying to do the update. You can bypass this issue by uninstalling the app stuck in waiting and then reinstalling it. 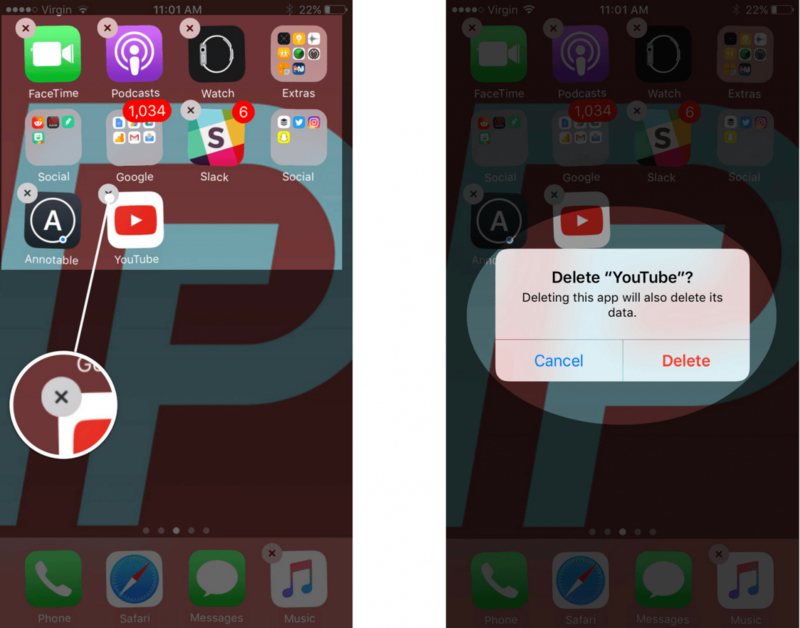 There are a few different ways to delete an app. First, hold your finger over any app icon until an X appears in the upper left-hand corner of the app icons, and they start to wiggle. If the iPhone app stuck waiting has an X, tap it, and follow the prompts to uninstall the app. If you don’t see a black X, you will have to delete the app another way. 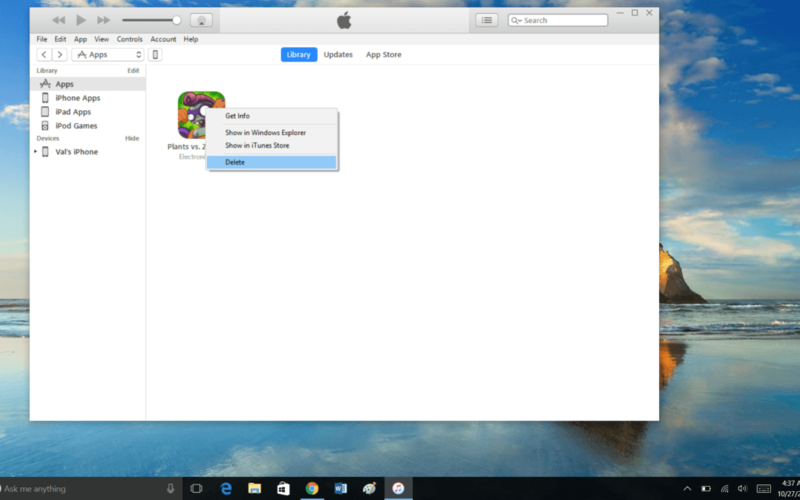 If you use iTunes to buy and sync apps, you can use this program to delete an app. To do that, open iTunes on your computer. Click the Library menu. This is located in the bar underneath File, Edit, etc. It may say Music, Movies, or another category of content. In the dropdown Library menu, choose Apps. If Apps isn’t an option, click Edit Menu and add Apps to the list. On the apps page, you’ll see a list of all the apps you’ve used iTunes to purchase for your device. Right click on the app and select Delete to remove it from your library and your iPhone. Now, you can download the app again on your iPhone. The latest version of the app will include the update that the previous version tried to update to when it got stuck. You can also delete an app in the Storage & iCloud Usage menu. To get there, go to Settings → General → iPhone Storage. If you scroll down, you’ll see a list of all the apps on your iPhone. 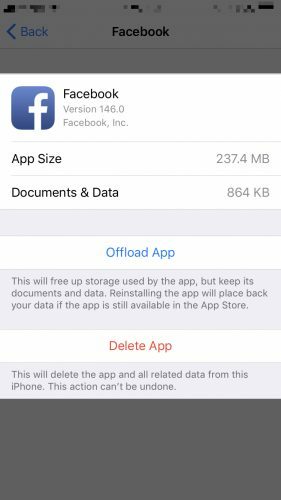 When you tap on an app, you have the option to delete or “offload” the app that’s stuck waiting. Is Your iPhone Out of Space? Sometimes, there are iPhone apps waiting because there isn’t enough room on your iPhone to download the updates. 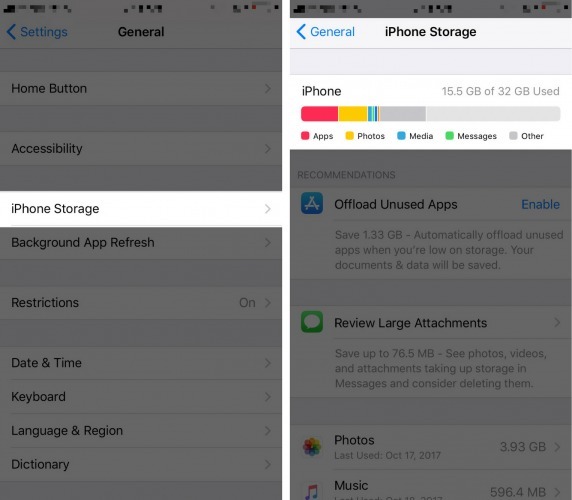 In iPhone Storage, you’ll see exactly how much room is available on your iPhone and which apps are using the most memory. Deleting apps you don’t use. Using iCloud to back up your photos and videos. Getting rid of long text conversations. Deleting files in apps, such as audio books, that take up a lot of space on your iPhone. Once you make more room on your iPhone, check your iPhone apps that are waiting or try reinstalling the apps. Software is the code that tells your iPhone what to do and when to do it. Unfortunately, software doesn’t always work properly. When that’s the case, it could be the reason for iPhone apps getting stuck while waiting to download updates. A simple way to help correct a software problem on your iPhone is to restart the phone. You’d be amazed how often this simple step helps! To restart your iPhone, hold down the power button. That’s on the upper right-hand side of your iPhone. Hold it for a few seconds until the screen changes. Then, slide your finger across the part that says slide to power off. Once your iPhone is off, count to 10 and then push the power button again to restart it. If a simple restart doesn’t help, try a hard reset. To do this, hold the power button and the Home button down at the same time. When the screen changes, let go of both buttons. Performing a hard reset on an iPhone 7 and 7 Plus is a bit different because Apple moved to a non-physical Home button. After all, the Home button on the iPhone 7 and 7 Plus doesn’t work at all if it’s not turned on! To hard reset an iPhone 7 or 7 Plus, press and hold the volume down button and power button together until the Apple logo shows up on the display, and then let go of both buttons. No matter which model you have, your iPhone will restart itself once you’ve released both buttons! If restarting the iPhone and a hard reset don’t help, you can try resetting your iPhone’s settings. This puts your software settings back to the way they were when you got your iPhone (or the latest version of your iPhone’s operating system). To do this, go to Settings → General → Reset. Choose Reset All Settings and follow the prompts on your screen. If none of these steps help, you can back up your iPhone and then restore it. There are a few different ways to do this, but we here at Payette Forward like to suggest doing a DFU restore. DFU stands for Default Firmware Update. If you go to a Genius Bar, this is the kind of backup and restore the Apple folks will do. But with a bit of help, you can do this yourself. Just make sure you have everything you want on your iPhone saved and backed up before you try this. Then, visit our article How To Put An iPhone In DFU Mode, The Apple Way for detailed instructions on what to do. 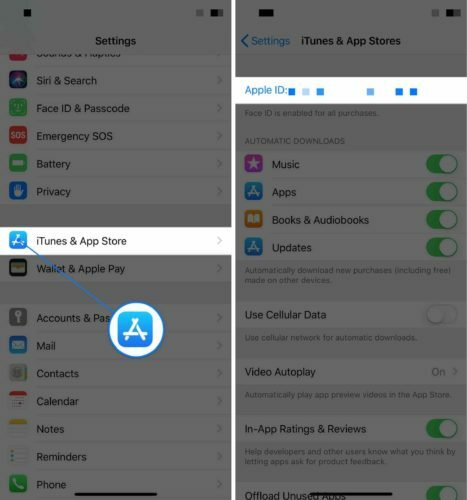 If your connection is solid, your settings are right, and your iPhone apps are still stuck waiting, the problem may be with the app itself or even with the App Store. You can reach out to the app’s developer with questions using the App Store. Simply go to the Updates tab and tap the name of the iPhone app that’s waiting. Tap on the Reviews tab and scroll down for App Support. Apple keeps a handy website with the status of their system. You can check this page to see if the problem is with the App Store. iPhone Apps: No Longer Stuck! Like many of the issues that can happen with your iPhone, when your iPhone apps are waiting to update, you have plenty of different options for fixing the problem. Tell us about your experience with getting your iPhone unstuck in the comments section below. Previous ArticleApple Music Not Working On iPhone? Here’s The Real Fix! 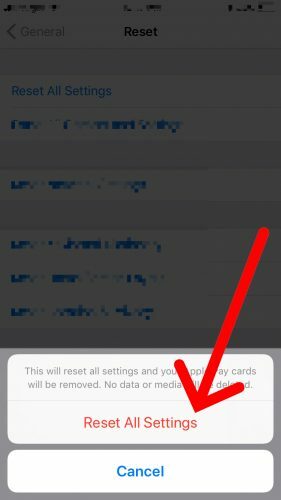 Next Article “iPhone Not Backed Up” Message: What It Means & How To Remove It!